I don't know about everyone else, but I love making specials using the Erfgame rules. A very handy method of transportation, but it is of a very expensive sort and somewhat vulnerable in combat despite its stack worth of hp. That's a devastating 30 attack (not counting leadership bonuses for a warlord riding shotgun) on ground units, which can come as a surprise attack from underground, and a respectable 15 on pesky air units. Puppetmaster 16/4/6/19/heavy, simple croakamancy, simple dollamancy, leadership, dance fighting. Might not look impressive, but it can build up an army of dolls to lead into combat, then replace fallen dolls with uncroaked as it goes, boosting them all up with dance fighting leadership. Oh, and don't forget access to new disciplines with every level. Shockamancy for when there is no army built up yet, foolamancy to make her harder to hit, dirtamancy for more varied units to control, flower power to poison her dolls, etc. Sand Wurm is a nice unit, but it's totally different from my Airbus. The Bus should never see combat. It just ferries strong units to a few hexes out from the foe and drops them off. It stays out of trouble itself. 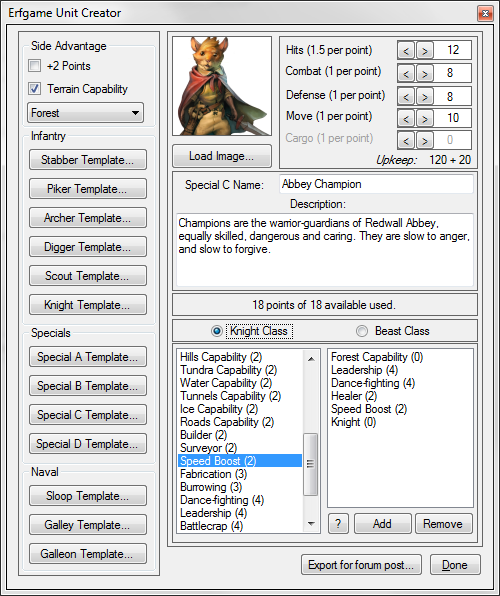 I think there is a lot of potential with Simple Mancy units, but I'd be inclined to give to A/B specials. It only has 1/3 the juice, but it has 1/5 the upkeep and takes half as long to pop. Been contemplating an "undead" side with Simple Croakamancy Special A units. Part of the reason I like doubling up with the D is it gives her something to do outside of turns where there is combat. That, and the potential for additional simple mancies is very powerful. But I agree, you are more or less throwing your chips into the pot with that one. One interesting thing with the Airbus is that while it can't transport heavy units itself, it can transport light ones that get promoted to heavy. That'd be a great strike force for taking poorly guarded cities, especially if you had a light special with siege that could go along for the ride as well. Side I just thought of, based off the cartoon Gargoyles. What do you guys think? I really like the special B unit. Pop one of them in every city and your efficiency goes up and all communication needs are taken care of. For the special D, I picked things to try and proxy general magical skills. Can you guys think of a better combo than Fool/Change/Bubble?